Most security programs are understaffed and overwhelmed with alerts, often defined by processes that rely on manual intervention and containment. They must keep pace with attackers who have access to intellectual resources, computing power and the backbone of the fastest digital delivery networks. Security orchestration levels the battlefield by bringing together disparate technologies and incident handling processes into a single console and facilitates processes with automation. The goal is to improve response time, reduce risk exposure and maintain consistent security processes. 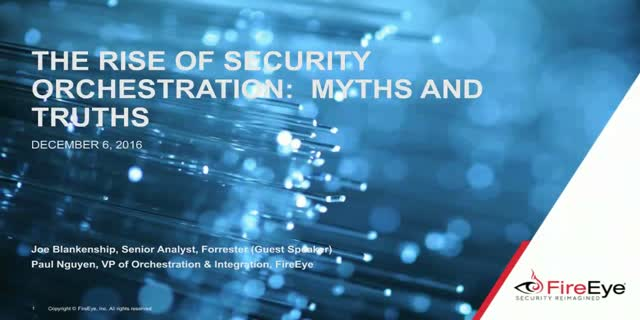 Register today for the latest on orchestration from FireEye and Forrester experts. Paul Nguyen, VP of Orchestration & Integration, FireEye. Joseph Blankenship, Sr. Analyst, Forrester. Presented by: Paul Nguyen, VP of Orchestration & Integration, FireEye. Joseph Blankenship, Sr. Analyst, Forrester.